LOOK AT THE COOL THINGS I MADE FRIDAY. 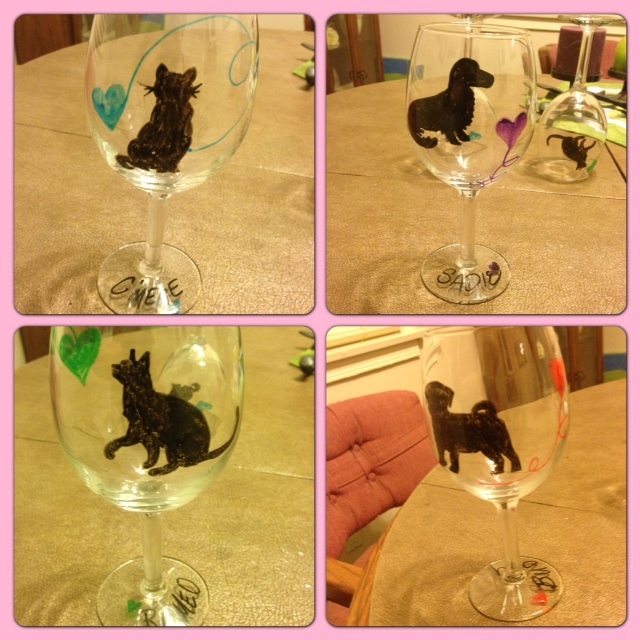 More Animal Wine Glasses – First of all we have to have a moment of silence for my Asscher wine glass (honoring my golden retriever daycare baby) that I made for myself. I used that one the most so, of course, it was the first to be broken. Boo! 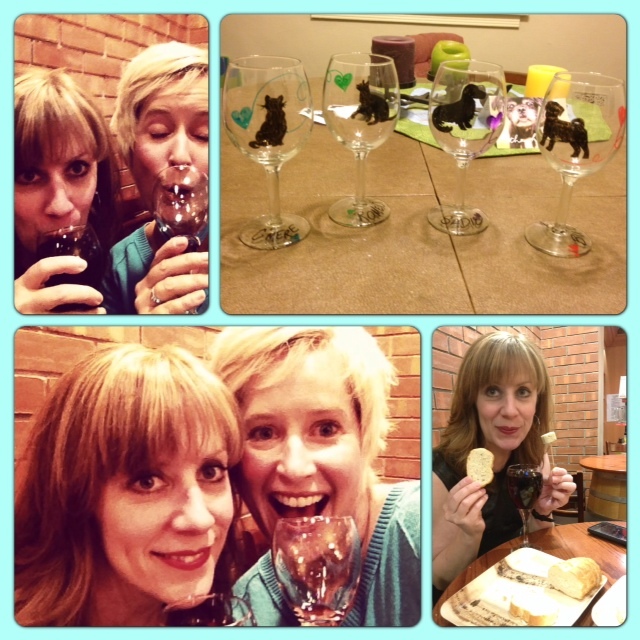 Now that we have taken the appropriate amount of time to mourn that loss to my wine cabinet … One of my good friends, Michelle, had her birthday celebration this weekend. Luckily for me it was at a winery so I could easily them my gift around that. Recently Missy had to say goodbye to her adorable pug mix, Buddy. He had a wonderful long and loving life with her. It didn’t take long for Missy to realize that her cat, Romeo, needed another dog playmate (as did she). She adopted a long-haired dachshund mix from the newly opened NKLA (No Kill LA). I decided to decorate her glasses in honor of her current and former pets who have given (and give) her so much joy. I have written a “how-to” on this already so check it out – here. 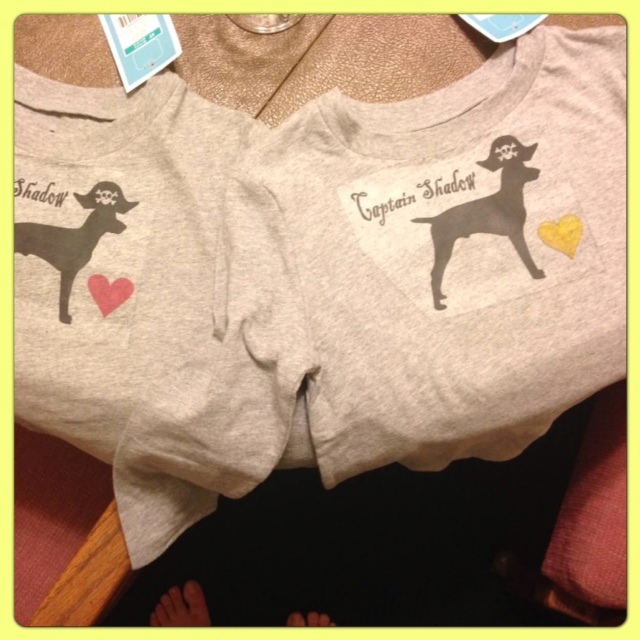 Doggie T-Shirts – In other dog news my sister and her family got a new puppy! There were down this weekend to pick him up. 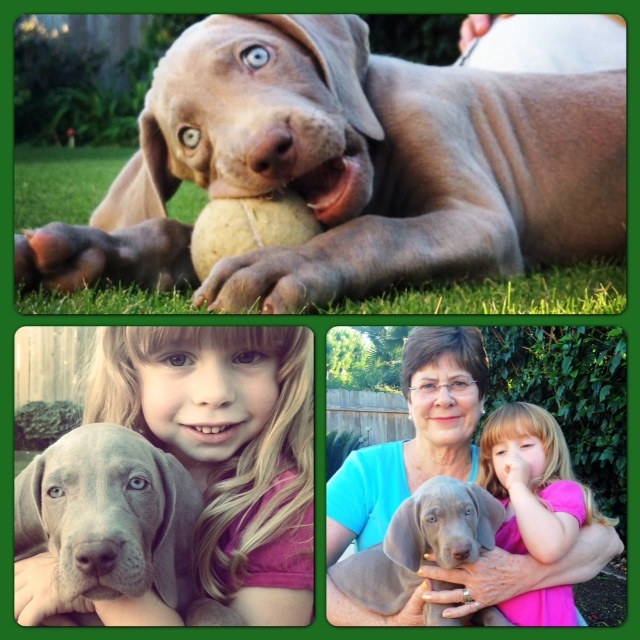 He is an 8 week old weimaraner named Captain Shadow. My young nephew loves pirates with all his heart (I suggested to get him over that phase we take him to see Captain Phillips but no one else seems on board with that idea) that’s where the “Captain” comes from. I’m not sure were “Shadow” comes from. Maybe because he is silver … you will have to ask my sister. I decided my niece and nephew needed a t-shirt that featured their new puppy! I had some left over printable t-shirt transfer paper from a project I did 10 years ago. I’m sure the age may make the t-shirt design less durable but I had it in my drawer so I used it! Between clearance and the new Cartwheel app I was able to get grey t-shirts for $3 each at Target. Woo hoo! I figured it wouldn’t take me long to whip up a design. I was wrong. I decided the dog needed a pirate hat on him I don’t really have great picture manipulating software so it took me a bit to figure out how to do that on paint. Longer than I care to admit. Then I had to remember how to flip all the images (you have to do that when you transfer onto light colors). The entire process took longer than I expected but I finally finished! I’d explain how exactly I did it but, to be honest, I forgot. Sorry!